Rev Fran: "It's All About Love." A sermon from Littlefield Presbyterian Church, on Good News Sunday. "It's All About Love." A sermon from Littlefield Presbyterian Church, on Good News Sunday. Today is officially Good News Sunday at Littlefield! I do believe we have good news to share-- important and life-changing good news. Sometimes I think I risk sounding like a “broken record.” Some of you have heard me say this over and over again, in various ways. But the more I’ve studied the scriptures over the years and looked for the main themes and the big picture, the more I’ve become convinced that our Christian faith is really all about love. God loves us. We are—all of us-- God’s beloved children. Our faith is about responding to God’s love for us and for all God’s children by loving God and loving all the people God loves. The Hebrew Scriptures include a lot of stories and verses that a lot of us find puzzling and troubling. Yet one of the major themes is of God’s steadfast loving-kindness. One of the other prominent themes in the Old Testament is how God keeps sending prophets to call people back to living in right relationship with God and neighbor… and how those right relationships are characterized by love and justice and mercy. The gospel message in the New Testament proclaims in various ways how Jesus came to live among us, full of grace and truth, to embody God’s love for us, and to show us how to live in the way of love. Jesus preached about the “kingdom of God” or the “reign of God” and how we are called to live into it. When people asked Jesus what the most important commandment is, he said what’s most important is two-fold: Love God. Love your neighbor. In the parable of the Good Samaritan, Jesus made it clear that your neighbor is anybody we encounter, anybody God puts in our path—even people who are different… people we might even see as enemies. Jesus made it very clear that it’s all about love. So, I keep wondering how so many people who call themselves “Christians” could be so confused about this. So many people in our society fear and mistrust those who are different: Muslims… people whose skin is a different color… immigrants… refugees. There are so many people in our nation who are hungry or food insecure or lack the basic things they need to live a life of dignity. The gap between the very rich and the poor keeps widening. This week, in particular, there has been a national conversation on social media and elsewhere about sexual assault. Women all around the country have been sharing their stories about being assaulted, and many others have been talking about being “triggered” by recent events and re-experiencing their assaults. Our nation is divided by partisan politics, and respect and trust and basic civility seem to be in very short supply. In recent weeks, there have been death threats against Dr. Christine Blasey Ford and Senator Flake. In the midst of all this brokenness and fear and injustice, how are we-- as people of faith-- called to live? I hear the scriptures saying that loving one another is a spiritual practice. As we work at loving one another—God is living in us and working in us and perfecting love in us. We love because God first loved us. If we say, “I love God” but hate our brother or sister, we’re lying about loving God. As we heard in First John, “those who do not love a brother or sister whom they have seen—cannot love God, whom they have not seen. Fear divides us. It leads to violence and destruction. Hatred and fear are toxic. They harm us-- as persons and as a society. But there is a way out. It is not the way of fear, and hate and violence. It is the way of love. If we’re honest with ourselves, we know that we have a long way to go to drive hatred and fear out of our lives and out of our society. Living in the way of love is not easy. Living in the way of love is too hard to do on our own power alone. And so… we need to be in prayer-- together. We need to open our lives to God’s call in our lives, as we live further into God’s dream for the world—the world that God so loves. We need each other. The Greek word ekklesia which we translate as “church” literally means an “assembly,” or those who are gathered together. We need to come together as a community of faith-- not for the sake of coming to a place called church-- but for the sake of coming together as part of the Body of Christ… for the sake of gathering as disciples who need to learn and practice living in the way of love. 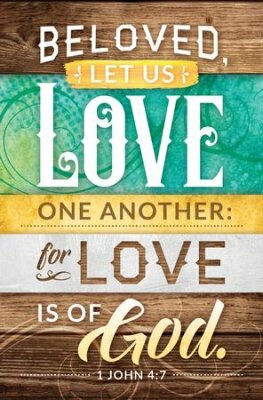 We need to love one another and encourage one another. We need to love one another into becoming more and more the beloved children of God we were created to be. We need to love one another into becoming the beloved community. God isn’t finished with any of us yet. Our love isn’t yet perfect, and it hasn’t yet cast out all our fears. But God is still working in and among and through us, through the power of the Holy Spirit-- leading and empowering us to become more patient and kind and generous… and helping us to become less envious or controlling… less irritable or resentful. God is still working in us, guiding us further into the truth, re-forming us, teaching us what it means to go out and be the church in the world, in this time and place. The good news is that as we grow more and more into God’s way of love, God’s love will cast out our fears. In a broken and fearful world, we can trust in the Holy Spirit to give us courage to pray without ceasing. As we work with others for justice, freedom and peace, our lives will be transformed, and together we can change the world. Quoted from Martin Luther King, Jr., Strength to Love (1963). I have read that he first said it in a sermon around 1957. This is an allusion to the “Brief Statement of Faith of the Presbyterian Church (USA)”, 1990.